We are proud to welcome SureFire Ag Systems as the primary sponsor of our “SureFire Picks to Click” feature for 2015. Our SureFire Picks to Click feature six players or units from across the state that we feel will have breakout performances on Friday night. SureFire Ag Systems provides solutions for the control and application of liquid and anhydrous ammonia fertilizer. 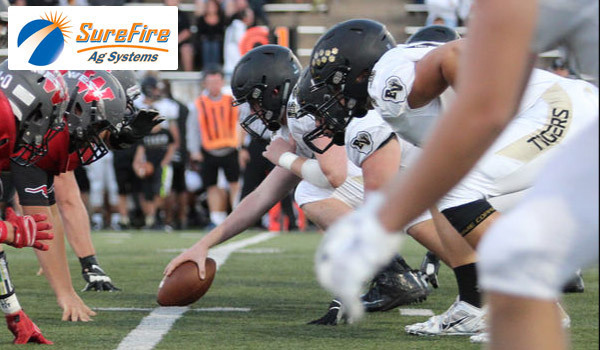 SureFire Ag is proud to support Kansas high school football. Learn more about these products, and other industry leading agriculture technologies by visiting www.surefireag.com and follow them on Facebook and Twitter. We have assembled a team of six media members across the state to each select one player (or unit) each week. We will track the cumulative statistics of our selections throughout the season similar to fantasy scoring. Check back next Thursday to see our picks for week five, and how the players performed that we picked the week prior. See the bottom of this article for details. Despite an enormous bullseye on his back after rushing for 2,100 yards last season, Halstead senior Blake Beckett continues to roll up yards in 2015. Beckett has rushed for 506 yards with six touchdowns through three games and is averaging a whopping 10.5 yards per carry. There's no reason to expect him to slow down this week against Smoky Valley. Blue Valley used a dominant ground game to top Bishop Miege 42-35 in last week’s Eastern Kansas League showdown. The Tigers rushed for 408 yards and six touchdowns against Miege. The Tiger offensive line has been solid all season paving the way for backs A.J. Totta, William Evans, and quarterback Colton McCumber. Blue Valley is averaging 315 yards rushing per game and 407 yards of total offense per game. Holt (6-2, 185) has been a strong contributor to the Bearcat defense and a key part of Burlingame’s success the past couple of seasons. Holt earned Kpreps All-District 3 honors last fall at defensive end after registering 93 tackles, including 11 for loss and five sacks. This season, Paul already has 37 tackles through three games with two tackles for loss and 5.5 sacks. Holt will look to have another strong defensive performance this week as the Bearcats look to stay atop the Lyon County League standings with a win over Waverly. Peters is following a long line of great running backs from Salina Central. Through three games, the senior has rushed for 716 yards and five touchdowns on 104 carries. A workhorse, Peters is coming off a 282-yard and three touchdown performance on 41 carries during a 41-28 win over Maize. The run-first Mustangs will likely look Peters' way numerous times Friday against Goddard-Eisenhower. Not only did Pittsburg lose all-state running back Alex Barnes to graduation last year, the entire offensive line graduated with him. Despite returning only three starters on offense, the Purple Dragons have rolled to a 3-0 start including a 37-0 shutout of rival Fort Scott last week. In that game the Purple Dragon offensive line produced 466 yards of total offense including 378 yards on the ground. They are not a big group, but they are athletic and should give Chanute (1-2) all they can handle on Friday night. An experienced offensive line has helped Wallace County open with a 3-0 record and maintain the No. 2 ranking in Eight-Man, Division II. The Wildcats have averaged 239 rushing yards and 148 passing yards against a solid slate that included Atwood-Rawlins County, Oberlin-Decatur Community and WaKeeney-Trego. Senior quarterback Eric Gfeller has cleared 100 yards rushing in every contest, and Luke Schemm has one 100-yard performance. Wallace County ranks seventh in the classification with 148 points and plays at Hoxie (2-1) in the district opener Friday.